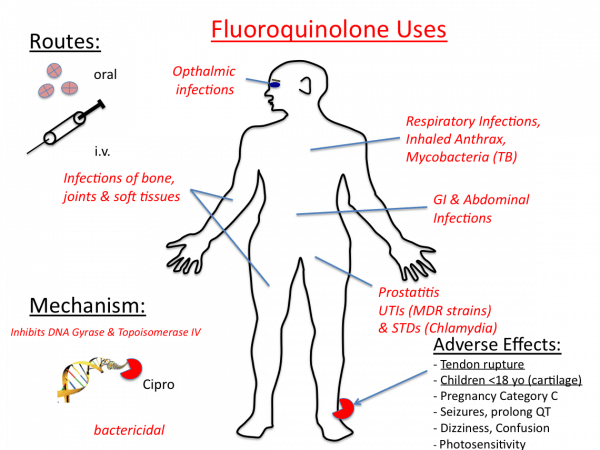 Fluoroquinolones are antibiotics used for a myriad of medical conditions. The safety of its use is currently in question due to its ability to produce neurotoxic effects in the brain and the central nervous system [1, 2]. The antibiotic fluoroquinolone belongs to the drug class quinolone. These are synthetic, bactericidal agent that has broad-spectrum activity. They function by inhibiting an enzyme that prevents the bacteria from replicating . Examples of fluoroquinolones include levofloxacin, ciprofloxacin, ofloxacin, norfloxacin and moxifloxacin . These drugs are prescribed for the treatment of conditions such as bone infection, bladder infection, chlamydia infection, diverticulitis, Crohn’s disease, cholera, kidney infections, otitis media, peritonitis and pelvic inflammatory disease [1, 3]. Fluoroquinolones are known to produce toxic side effects. The Food and Drug Administration of the United States of America has issued a warning against the use of Fluoroquinolone antibiotics that are taken orally and by injection because of the possibility of peripheral neuropathy. This is not the first warning the US FDA have released regarding the use of these anti-infectives. A few years ago, a warning was release for the use of these drugs because of the possibility of severe tendon damage. These adverse effects appear because of the fluoride molecule attached to the quinolone. Fluoride increases the potency of the drug but it also increases the permeability of the drug to hard-to-reach tissues such as the brain and the central nervous system. Fluoride is a potent neurotoxin and produces such effect when it reaches these tissues . The intake of fluoroquinolone is associated with the following toxicity symptoms [4, 5]. Those who take fluoroquinolones may experience tingling and numbness, malaise, dizziness, weakness, pain, anxiety and panic, psychosis, memory loss, headache, tinnitus, and alteration in visual, auditory, and olfactory functions [4, 5]. Aside from the occurrence of tendon ruptures, there may also be tendonitis or inflammation of the tendons, rupture of tendons, and swelling of the joints [4, 5]. Some of the symptoms related to the cardiovascular system may include chest pain, shortness of breath, palpitations, and tachycardia [4, 5]. A small number of patients may manifest with abdominal pain, vomiting, nausea, and diarrhea [4, 5]. There are those who develop skin rashes when taking fluoroquinolones. Increased sweating, hot or cold intolerance, and alopecia or hair loss may also occur [4, 5]. The treatment and management of fluoroquinolone toxicity are focused on discontinuing the medication and provide symptomatic relief. Once the patient has manifested any of these toxic symptoms, the intake of the drug is discontinued and they will be given another antibacterial agent that is appropriate for their condition. Supportive measures that will be given will depend on the symptoms that they have manifested. Research have shown that provision of intravenous antioxidant therapy is beneficial in improving the condition of those who have fluoroquinolone toxicity although more research is required in this realm [1, 4, 5]. The key to the prevention of fluoroquinolone toxicity is to inform the physician right away if any of the aforementioned symptoms arise. This will ensure that the condition will be addressed promptly and the patient will not develop any complications [1, 3, 5]. The use of fluoroquinolones can be dangerous and so the patients who take this medication should be vigilant in monitoring toxicity signs and symptoms. Feel free to add in the comment section any additional information that you may have regarding the use of these drugs. You can also share this article on different social media sites to help raise the awareness about the risks of fluoroquinolones. Strauchman, M., & Morningstar, M. W. (2012). Fluoroquinolone toxicity symptoms in a patient presenting with low back pain. Clinics and Practice.